Map of 2017 Philadelphia property tax assessments from the Office of Property Assessment. 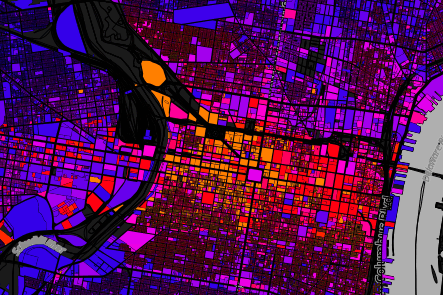 The City of Philadelphia's Office of Property Assessment on Wednesday released a visual heat map and corresponding raw data that reflects the city's shift in market valuation based on land rather strictly taxable properties. In the city's 2017 new assessments, the OPA incorporated the results of its Actual Value Initiative and updated values based on a model that adjusts previously under-assessed land, according to PlanPhilly. The values also reflect OPA's 2015 initiative to identify city parcels with a high "coefficiency of dispersion," a metric that takes into account outliers in "Geographic Market Areas" whose value is higher or lower than the median of similar properties. The revised assessments show that while 84.45 percent of properties had no change in value, 14.34 percent of parcels show an increase in their total taxable value. Just 1.21 percent saw decreases. The majority of the increases were held to under $400, with a concentration of higher values in and around Center City. Properties operating under the city's 10-year tax abatement for improvements also saw some gains based on a reassessment of the "contributory value" of land (City Councilman Alan Domb has proposed extending the tax abatement to 20 years). As Philadelinquency's Christopher Sawyer notes, one of the glaring outcomes of the reassessment is the discrepant value of vacant lots compared to adjacent properties. Vacant lots are unfairly being assessed way below adjacent property. Land values should look like smooth graduations of color, steadily increasing values should approach some feature that is contributing to land value—like major employers, transit stations, water features, parks and other things that make land valuable. But in Philadelphia we are doing the exact opposite. According to PlanPhilly, however, OPA is still completing its assessment of Philadelphia's vacant lots and will have more accurate values updated some time in June. Next year, OPA plans to turn its attention to update values for commercial properties and will conduct another full assessment in 2018.